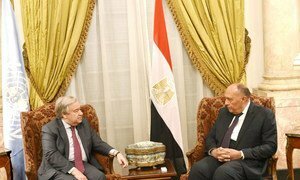 Photo: UN/ Mohammad Abu Ghoush. Secretary General António Guterres addresses the World Economic Forum at the Dead Sea, Jordan. 6 April, 2019. 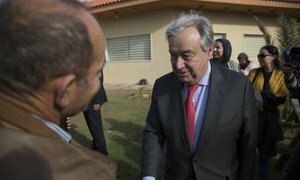 Following his appearance at the WEF meeting, the UN chief travelled to the Baqa’a camp, one of six "emergency" camps set up in 1968 to accommodate Palestine refugees and displaced people who left the West Bank and Gaza Strip as a result of the 1967 Arab-Israeli war. Mr. Guterres also visited one of the UNRWA-run schools in the camp and, in remarks to the press made following the visit, he insisted that such schools must not close: "in 700 schools, 530,000 Palestine refugee children are learning about human rights, about democracy, about tolerance, making the conditions to be exemplary citizens. And this is something that warms my heart."